I'll miss the color--sorry, I mean colour--but am excited to see what you guys do with this. Pardon my rookie question: What is the Black Static fly? then it reappeared in various issues and it could be seen on the back of that cover but reversed as if seen through the cover. Ha, I wasn't taking "fly" literally enough! Thanks for enlightening me. Ooooo, that cover is mighty purty. I particularly like that the artwork has more real estate. Colour me excited! Last edited by Baph on Sun Jun 10, 2012 5:41 am, edited 1 time in total. My personal two-penneth.... I think the new cover looks fantastic. I prefer it simpler, starker, eerier. I didn't go a bundle on the cover divided into sections - it was getting far too busy. 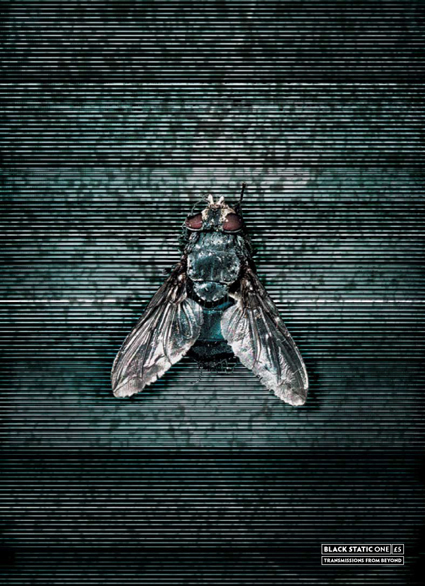 I liked the earlier covers that had one strong image (the fly, etc) - far more powerful and they really stood out. I never had a problem with the entire interior being black and white. For a horror mag, this is a style statement! I won't object to the point size being bigger either. I feel the same way Steve. Those early Black Statics had absolutely no retail distribution so it didn't matter. When you get a distributor they insist -- in my experience -- that you make certain concessions which to me have always seemed old fashioned and counter productive, particularly for a magazine like Black Static (where the content doesn't exactly lend itself to call outs anyway), and also for the retail trade itself, especially since it's been shrinking the way it has. I've argued my case, ended up compromising. But not this time. The point size of the fiction is only slightly bigger btw, 10pt as opposed to 9.6pt, but it could still make a difference. The non-fiction remains exactly the same (9pt). The columns are narrower, obviously. No doubt there'll always be something to improve upon. It'll look pretty much the same inside, so please don't expect anything revolutionary in that regard. If there are any Interzone readers visiting this thread, please let me know what you think of the possibility of Interzone moving to this new size. I'd hope we could keep the colour inside and/or increase the page count to 128. I would definitely like to see more books coverage in IZ. At the moment, I feel it's the only area where the "new" IZ lags behind the old one, and I'd love to see that turn around. Maybe the format change is the way to do it? FYI, the whole of the cover will look something like this. Lovely. That's one nasty smile, too. I love that cover. Looks superbb. That's a pretty cool cover!! Looking forward to seeing, and reading it in the new format. Awesome cover. Look forward to seeing the new format. Love that cover! Well done! Salivating.